To decide to write a book about manufacturing a small object approximately 3/4"round and 2" TO 4" long would seem as if the subject matter could be very limited for the author. However, this object, a spark plug, is a device greatly underrated by the unknowledgeable, and yet no internal combustion engine can operate without it. The Physical properties of the component parts, which make up the spark plug, must have specific properties to operate in diversified environments. It is not the intent of the author to deal with the technical aspects of the spark plug, but rather to "spin the tale" of the entrance of the Electric Autolite Company Toledo, Ohio, into the market. Also, it is the writer's desire to relay some of the trials and tribulations of a major manufacturing Corporation entering a highly competitive field in an area when capital risk money was scarce. Included in this narrative will be the establishment and fate of the Electric Autolite Company's Plant in Fostoria, Ohio. 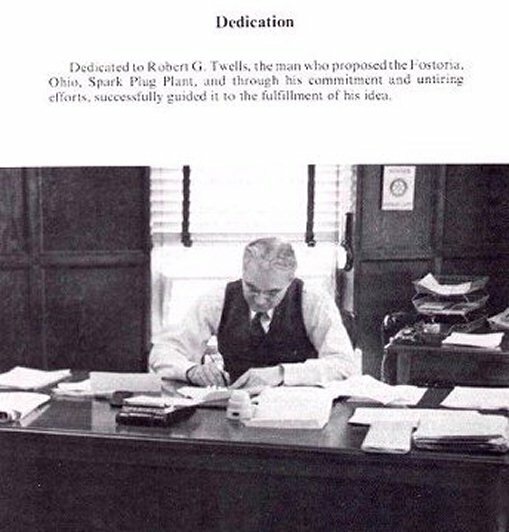 Dedicated to Robert G. Twells, the man who proposed the Fostoria Ohio, Spark Plug Plant, and through his commitment and untiring efforts, successfully guided it to the fulfillment of his idea.